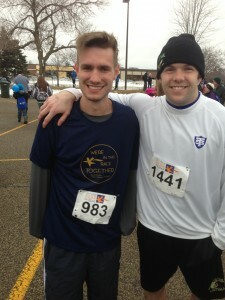 Chace and friend at s Get Your Rear in Gear Race in 2013. 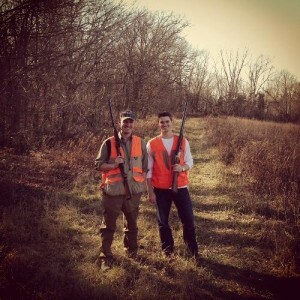 My son, Chace Johnson, 27 years old was diagnosed with stage IV colon cancer of October 2011. Chace went into his clinic complaining of stomach pains. His physician took an x-ray and advised him to go to the emergency room immediately. By late Thursday night Chace went from the Abbott Emergency room, to a room at Abbott Northwestern Hospital. After a series of tests, they uncovered that there was something pushing on Chace’s intestines. Surgery would be required to remove the mass. On Saturday morning, Doctor Johnson confirmed that the tumor was colon cancer and laparoscopic surgery was scheduled for Sunday morning. We were shocked when we found out Chace had colon cancer. There is no cancer in our family! Chace was diagnosed one week before running the Twin Cities Marathon and his twenty-fifth birthday. He has had 5 surgeries and is on his 4th chemo drug. We were told the chemo was working and a month later a PET scan showed the cancer was everywhere. This past August Mayo surgeons told us to take him home and set up hospice. Chace, as well as us, refused to give up hope. He had a surgery to remove more intestines and since then he has been on TPN besides a new chemo pill. 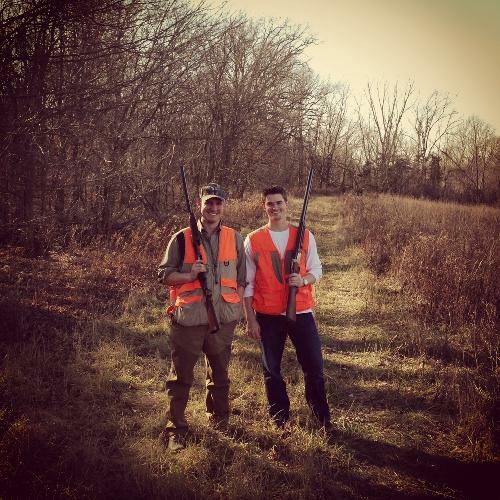 Chace and a friend hunting. He continues to work through all of this; his work has been great at letting him off for doctor’s appointments and surgeries. Last November 2012 we went to Pittsbugh for a month for him to have the Hyperthermic Intraperitoneal Chemotherapy (HIPEC) surgery thinking this would do the trick but in June we found out again cancer was back, which took us to the doctors at Mayo who did another surgery to stop his blockage at lower bowels. He had radiation to reduce the tumor, and then got an ileostomy where intestines were removed. Throughout 2013, Chace had his 3rd, 4th and 5th surgeries. A year ago he had his temporary ileostomey bag removed from his HIPEC surgery and returned to work. Not long after he started to feel back pains and had problems eating and unfortunately found out the cancer was back. In July, he started radiation to reduce the tumor in his colon and found many blockages in his intestines. In August, he had his 4th and 5th surgeries to remove most of the intestines they could. September he started TPN and a month later went on his chemo pills. 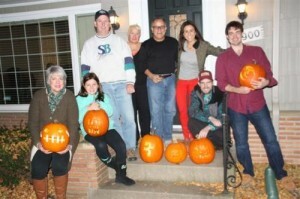 Chace and his family at the 5th annual Pumpkin Carving contest that his family hosts. Luckily, October of 2013, a PET scan showed the tumors were 50% less active, his blood work was good, the cancer markers improved. They had stopped TPN. In November, the PET scan showed a miracle, the large tumor in his lower colon showed reduced activity. A month later he went of TPN and returned to work full time. This past January, we went in for another PET scan that showed more reduced activity and that two small tumors were one. He still continues his chemo pills every day. He now has small bowel syndrome but always continues to have a positive attitude. Since Chace’s surgery, he has been on a steady path to recovery! Sense of humor fully intact, he is showing signs of the Chace we’ve all grown to love. His friends all say he inspires them with his strength and will beat this. For me as a mother of an adult child with cancer it has been hard. All the ups and downs, I don’t want to smother him but I wish I could fix it. He is such an inspiration to me that if he can work and live life I know I can do the same. It breaks my heart to see my son going through this. He is just too young to have this. He is just starting his life. He said this would not stop him on what he wants to do. He applied to an MBA program, but had to delay starting due to cancer coming back this summer. He has plans to start the program this spring. 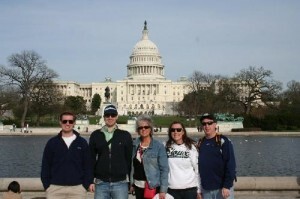 Chace with his mother and family in Washington D.C.
All the support from friends and community has helped. We have gotten closer as a family. We have had a familydinner weekly at my house since October 2011. I have reconnected with friends that I hadn’t seen since the kids finished high school. I run into people I don’t even know in Edina that say they know our story and are praying for us. I gain my strength from all of that. Please continue to send your love and prayers to Chace and his family. We are remaining hopeful that Chace’s strength and faith will give him strength through this journey. God Bless you and your family Chace! I was diagnosed with Stage 4 Colon Cancer in 2011 @ age 51 and have gone through 3 major surgeries and 2 series of chemo. So far, so good for the past year! Prayers to you and your family! Chase, Keep up the good work. Our thoughts and prayers are with you.